Had one daughter Rosemary. She married William Morgan Rounds in 1944. Rip and Emma’s descendants include three grandchildren, eight great-grandchildren, and one great-great-granddaughter. After working in the coal mines and on the railroad, Rip started a tavern known as the Old Tin Front in Ladd, Illinois. in 1936, Rip closed the doors on the Old Tin Front. He reopened the business at its current location and renamed it Rip’s Tavern. From that year on, the business started to grow. Emma was a beautician by trade, and ran a beauty parlor out of their home. In the early ’40s, when the boys went off to war, Emma left the beauty parlor and joined Rip full time at the tavern. Rosemary would eventually reopen the beauty parlor, but Emma stayed at Rip’s. In the 1920s and early ’30s, Rip was the star shortstop of the Ladd Moose Baseball team. In 1977, he was inducted into the Illinois Valley Baseball Hall of Fame. 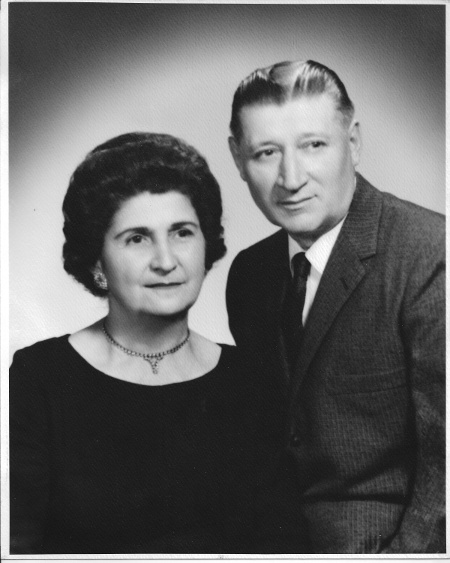 Rip and Emma retired in 1970 when the tavern was sold to their son-in-law, Morgan Rounds, and nephew, Ralph Grivetti. Although retired, Rip and Emma never did stop working at the tavern. They continued to help out and do small jobs well into their 80’s, even including cooking Friday lunch for the grade school kids. We, at Rip’s Tavern, can’t thank you enough for all of your sacrifice and hard work…None of this would have been possible without you!! !